Laser triangulation is based on the reflection and scattering of a laser beam from a surface to be measured. 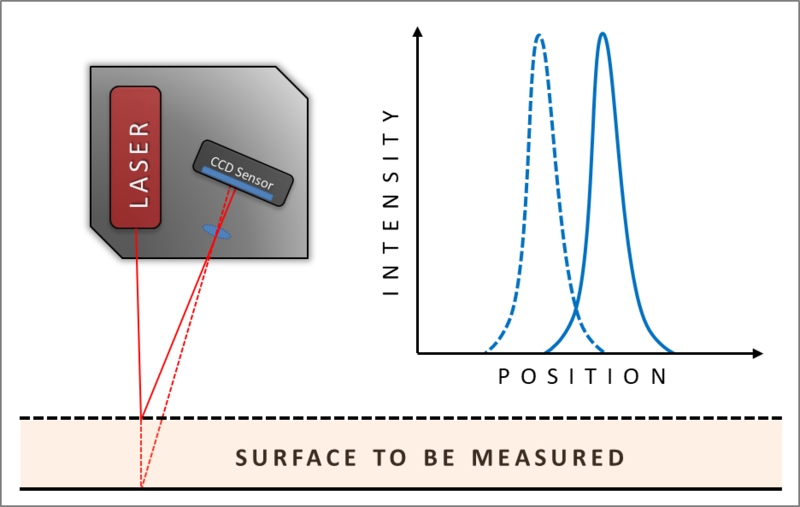 Via the position of the reflection peak on a linear CCD detector, the distance between the surface and the laser triangulation sensor can be determined due to the geometry (see Fig. 1). Hence the reflection and scattering properties of the surface of the material to be measured is crucial for the measurements accuracy and reproducibility. A well-known problem of such critical reflection properties is the so-called speckle effect, which greatly affects the detectability of a reflection peak due to interference in diffusely reflecting (rough) surfaces and thus greatly distorts the laser triangulation measurement without special precautions. Following, we focus on another issue related to the reflection properties, namely the measurement of translucent (semi-transparent) materials with textured surfaces. This is a common challenge in the plastics industry e.g. during the online thickness measurement in a calendar line. Calendaring designates a process where rotating rollers produce a thin film of plastic material, which is directly laminated on various web type substrates. It is used to produce a number of daily used products such as PVC floor covering, covers for transport and utility vehicles, synthetic leather, adhesive tapes and many more. An inline thickness measurement provides a control of the rolling process, which ensures the homogeneity of the produced material as well as it helps to minimize the raw material input. The colouring of the materials is diverse; the surfaces can be textured as well as the material can be translucent or almost transparent. So the challenge is to set up a reliable and accurate Laser optical thickness measurement, which can handle this variety of material properties. 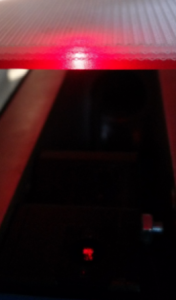 To illustrate the problem, Figure 2 shows the cross-section of such a translucent and structured material while measured with a red laser beam. As immediately visible, the laser is not just reflected from the surface. Instead, the scattered light illuminates a large area and multiple layers are visible due to the refraction of the light between these interfaces. Such reflection and scattering properties in combination with the red colour of the Laser beam result in a rather broad intensity pattern on the CCD sensor with more than a single peak and a broad background. Figure 3 and 4 shows two phenomena: due to the rough surface and other influences, the number and intensity of the maxima, as well as the width of the intensity peak, varies strongly from position to position. So it is very difficult to assign an accurate peak position, which greatly affects the accuracy of the thickness measurement. This effect is illustrated in Figure 5, where big deviations or “jumps” in the thickness profile can be seen due to the inaccurate assignment of the peaks position. Therefore the measurement does not reflect the actual thickness profile of the material. A further problem is also the poor reproducibility of the measurement. The MESACON F5500 laser thickness measuring system uses a special arrangement of the laser distance sensors in combination with mathematical corrections in order to eliminate the mentioned disturbing influences as far as possible. The result is a nearly ideal and sharp intensity peak on the CCD sensor that allows a clear assignment of the peak position as shown in Figure 6. The small background of scattered intensity does not affect the measurement since the distance is determined by the intensity maximum. The measured thickness profile reflects the actual geometric thickness profile of the investigated sample. This has been independently confirmed by a tactile reference measurement. Due to the variety of materials to be measured, a material recipe management system is applied to the MESACON software that can be selected via a drop-down menu. The setting can be individually adapted and optimized for each product. Apart from the sensor accuracy itself, the system accuracy of all laser optical thickness measurements is subject to static or dynamic deformation of the measurement setup. The reason for this is the initial distance of the two laser sensors which enters into the calculation of the thickness. So a deviation in the sensor distance of a few microns, e.g. by deformation of the mechanics, leads directly to a distortion of the measured thickness value. Cost-intensive self-referencing systems can be used to compensate those external influences. In contrast, the MESACON F5500 measuring system is largely independent of thermal expansion or contractions due to its innovative mechanical design and automated calibration procedure. This enables measurements in harsh industrial environments as well as for scanning applications with large material widths. The new laser optical F5500 system of MESACON enables reliable thickness measurements also for translucent and textured materials, independent of the material composition. This offers completely new application possibilities for non-destructive inspection and process control of flat products / web-fabric materials in the plastics industry.